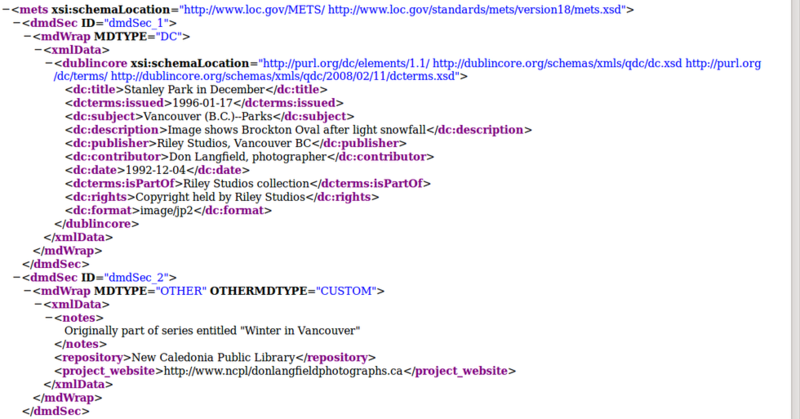 This page documents the workflow and METS content for lower-level metadata import - i.e. metadata to be attached to subdirectories and files within a SIP. For simple objects, the user places files in the objects directory, with or without intervening subdirectories. The imported metadata are attached to each object. For compound objects, the user creates one or more subdirectories in the objects directory, each containing the files that form a compound object. The imported metadata are attached to each subdirectory. The first row of the csv file consists of field names. 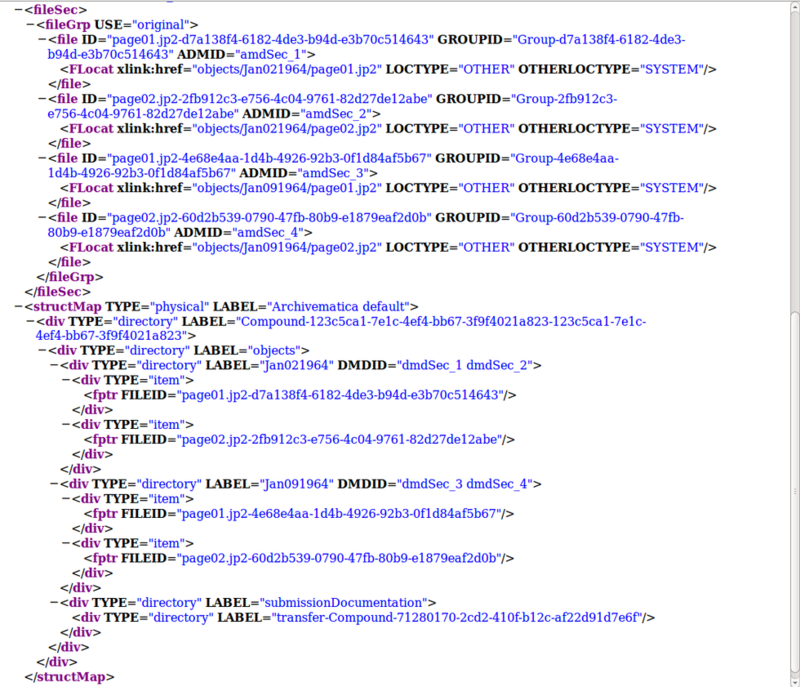 Dublin Core field names must contain the "dc" element in the name, eg "dc.title"
If the metadata are for simple objects, the csv file must contain a "filename" column listing the filepath and filename of each objects: eg "objects/BrocktonOval.jp2"
If the metadata are for compound objects, the csv file must contain a "parts" column listing the names of the directories containing the items that form the compound object: eg "objects/Jan021964"
Note that filenames can be duplicates of filenames in other subdirectories if desired. For example, the name "page01.jp2" can occur in multiple subdirectories. All Dublin Core elements are used to generate a dmdSec for each directory or file with MDTYPE="DC"
All non-Dublin Core elements are used to generate a dmdSec for each directory or file with MDTYPE="OTHER" OTHERMDTYPE="CUSTOM"
This section provides csv file and METS file examples for simple objects - i.e. individual files that are not pages in a compound object such as a book or a newspaper issue. This page was last modified on 23 March 2017, at 15:38.